Beyond Blue advised that in this equates to 1 in 6 women and 1 in 8 men living with Depression at any one time. We also know that working with people who are living with Depression at times can be a significant challenge for Rehabilitation Professionals. What medical research and lived experience tells us however, is that engagement in work can be a very positive and useful recovery tool for people living with Depression. Work does not replace other therapies such as psychological or psychiatric treatment, however, it can be a positive way of being able to practice new skills that are being taught or explored in treatment. There is a lot written about how workplaces are becoming increasingly aware of employees who are experiencing Depression in their workplaces. We now have a growing social impact from organisations such as Beyond Blue, Super Friend, ReturntoWork.net.au, all providing great resources that help employers and co-workers develop supportive workplaces for someone living with depression. As Rehabilitation Professionals we have a responsibility to help our client’s living with Depression be able to engage with work and their workplace. Living with Depression does not mean someone can’t work. Often work can be a great help to stabilising symptoms and improving health outcomes for people living with Depression. Here at Purple Co, we have heard a lot of fears being expressed by a person who has experienced absence from work due to Depression. What if I can’t do my job? What if I can’t cope and I break down? I don’t want people to ask me how I am? I don’t want people to know why I’ve been away from work. What if I can’t cope at home after I’ve been at work all day? While it is responsible for us as Rehabilitation Professionals to be encouraging clients of the importance of returning to work while they are recovering from a depressive episode, I wonder if we have been as good at helping clients understand how we can help them with some of their biggest fears about returning to work? I’ve written this post in the hope that any person who is living with Depression or recovering from a depressive episode may know what to expect from working with a Rehabilitation Professional and help them to ask the questions that they need answering, to help make the return to work process successful for them. This is a really common question from pretty much every client we’ve ever met at Purple Co regardless of diagnosis. After any time away from work it’s reasonable to feel like you may not know if you can do the job any more. In addition, when you are living with symptoms of Depression you don’t quite feel the way you used to feel, and that feels “abnormal”. It’s expected that you would have questions about your ability to keep up the pace; managing interpersonal communications; multi task; manage competing demands for example. A Rehabilitation Professional can assess the nature of your job. Assessing the tasks, the environment, the tools, and the people you need to interact with and discuss with you how we maybe able to re engineer the job to help you manage your symptoms for success until you are more confident being back at work. Our goal here is to personalise your work and your workplace to help you in your recovery. For example. Some people report that they find it hard to think quickly when they are living with Depression, therefore making sure that your work tasks are structured in such a way that allows you to focus on one thing at a time would be helpful. One of the unique skills of a Rehabilitation Professional is our ability to apply the experience of your symptoms to your work tasks so that you can gradually increase what you are doing at work, building on your knowledge and your skills, while building your resilience to be in the workplace. This is why we don’t advocate for people to have to be 100% well before returning back to work, because on the whole people more successfully return to work when work is a part of their recovery. 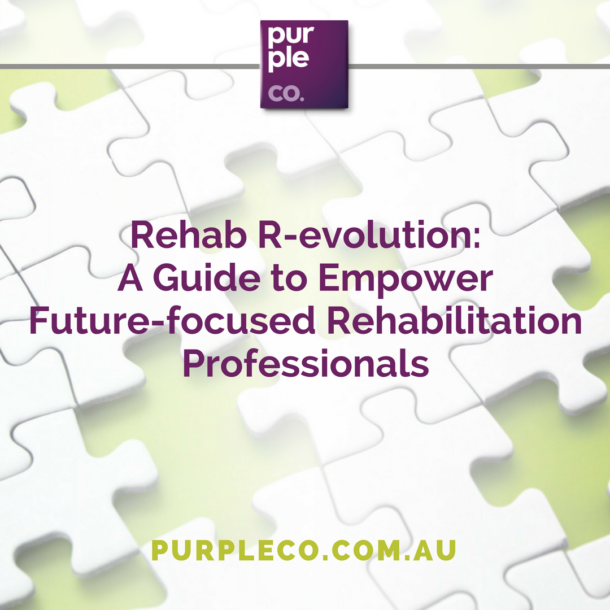 This is where a Rehabilitation Professional can work with you to develop a Flare Up management plan. We use Flare Up management plans with a lot of our client’s and they find them a really useful tool to know what to do in the event that symptoms or feelings are becoming unmanageable. For example, if you know that news events can trigger more feelings or stronger feelings then avoid the radio or TV while at work including in the social spaces. It’s imperative that you know exactly who you can talk to when at work if you notice that you are feeling worse. It’s often most helpful to set up the ‘how will we communicate when I’m feeling bad’ scenarios before they happen so everyone who needs to know, knows what to do, and people who don’t need to know, don’t have to know. This is a common concern for people living with Depression. We either state the truth, I am depressed, or more often than not we lie and say “I’m fine” which often doesn’t help. What I’ve found to be useful is to plan with client’s how they would like to respond this this question in a way that is polite but also gives them a sense of dignity. For example – Thanks for asking, I’m doing OK today. Or I appreciate you asking, today’s is difficult for me but I know what to do. What I have observed in 20 years of doing this work is that most people don’t want to be rude or nosey – we just haven’t been very good at talking about mental health at all. Our lack of experience tends to make us clumsy. We aren’t very good at it in families and we aren’t very good at it in workplaces. Every time someone is courageous enough to return to work while they are recovering, they are giving us all the opportunity to learn how to get better at talking about mental health is a way that is respectful. Similarly, to the above fear statement, its often better to have prepared for these conversations before they occur. Remember you are in control of what you want people to know about you and your life. There is no rule that says you must share with everyone. I personally would want to keep a lot of my illness and medical history personal and private. While we would all like to live in a world where talking about mental illness is just as easy as talking about a broken leg or a surgical scar, the fact of the matter is we still have some level of stigma in our society. Again, I have found it useful to plan with client’s how they would like to respond to questions or statements about them having been absent from work. Simple responses such as – I’ve been unwell but I’m on the mend, thanks for your concern. We cannot control how someone will respond to us, and when we are feeling uncertain or vulnerable it is common to want to control the emotional reactions of others. However, we can’t. What we can control is how we want to be in that moment and how we want to respond. Being at work should not be the sum total of all that you have in your life. It can be expected that any return to work after any time away from work will increase feelings of uncertainty or fatigue. The smart thing to do here is to make one change at a time. When you are preparing for a return to work, make sure you aren’t making too many more changes that effect your energy and mood at the same time. Being able to successfully navigate a return to work means your Rehabilitation Professional will have spent time working with you to sort through how you will get ready and prepare to attend work; and then also how you will manage the transition home form work once the working day is done. Just going to work and performing work tasks is only a part of how we need to think about and plan for a success at work. Learning how to integrate work back into your whole life will take some time. Often, we are all in a rush to be better now, but that’s not how recovery works. Recovery needs to be planned, thought out and prepared for. Returning to work while you are living with Depression is no different. Please understand that you cannot be in a rush to get “back to the way I was” after a period of mental illness. It is important for you to stop and think about who you are now and be aware of the extra energy you maybe putting into trying to keep up appearances. Rehabilitation professionals can help support client’s to accept where they are in their recovery right now and plan re-entry to work using all the individual’s resources available at home and in the workplace. And then we can adapt that plan as their recovery progresses. There is no longer any need for the misconception that people living Depression cannot or should not work. We can. We just don’t have to do it all on our own. Learning what help is available, and how to ask for help that will help you is a great way to start this conversation. Jo is all about connecting people to purpose through inspiration and innovation. She is the Founder, Director and Principal Consultant of Purple Co, a team of specialist allied health consultants dedicated to helping people who experience injury illness and trauma reclaim their lives through work. Jo is passionate about the health benefits of work and truly believes that everyone has the right to meaningful and rewarding employment. Purple Co grew out of this belief as a truncated form of PURpose for peoPLE.